The QCP-1553 module is a rugged, reliable, full featured, Compact PCI module designed to provide a stand-alone, MIL-STD-1553A/B interface for avionics applications. 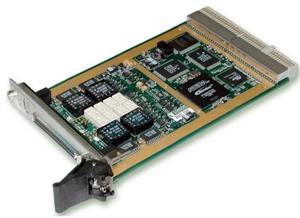 Up to four independent dual redundant MIL-STD-1553 databus streams are supported by the 3U QCP-1553 module. Additionally, the module offers full functional test, simulation, monitoring and databus analyzer functions for MILSTD-1553A/B applications. An onboard IRIG-B time code decoder and generator allows users to accurately synchronize single or multiple QCP-1553 modules to a common time source. The QCP-1553 module is available in single or full function (RT simulation, monitoring, and bus controller) configurations. QCP-1553 multi-function interfaces are easily configured to operate as a simultaneously as a Bus Controller, 31 Remote Terminals and as a Bus Monitor. Single-function QCP-1553 interfaces have all the features and functionality of the multi-function versions, but only one major operational mode is enabled at a time. Each interface can emulate either a Bus Controller or 31 Remote Terminals or a Bus Monitor.